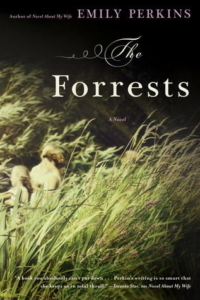 Perkins is trying to show us that these quiet yet profoundly felt moments are what make up a life, in this case Dot Forrest’s. We follow Dot from childhood through old age, beginning in 1970s New Zealand, with Dot’s father, a frustrated American actor, directing Dot, her three siblings, and Daniel, a boy who becomes unofficially adopted by the family, in a home movie. Soon afterward the father leaves, and Dot’s mother takes the children to live on a “wimmin’s commune,” where they stay for an indeterminable length of time until the father’s return. All of this occurs in the first chapter, which covers the most territory in terms of time and action. Each subsequent chapter examines a particular key moment (a few hours, a few days), with years passing between. Many chapters focus on the buildup to a dramatic turning point, ending just before the realization or confrontation occurs and forcing the reader to rely on descriptive detail and altered character interactions to fill in missing information. The overall effect is ephemeral. This may be Perkins’s intention, but it leaves the reader on ever-shifting ground. She leaned forward with the powerful, irrational urge to explain the joy of driving hard out with no headlights while Daniel sat in the passenger seat singing, the music as loud as the 8-track would go. The way the intense, furious guitar calmed the air, released what pressure was inside him, or inside her. As they age, Daniel comes to embody Dot’s regrets; while he strikes out and travels the world, she stays home with her children and develops agoraphobia. Dot is closest to her sister Eve. They are viewed as a unit when they are young, often mistaken for one another by classmates. Yet as they grow older, their paths diverge. Eve envies Dot’s security and routine, her sense of belonging; Dot envies Eve’s freedom. The first half of the book alternates between their points of view, the descriptive prose staying consistent throughout, as if the sisters think in the same terms, two halves of one whole. When Eve’s perspective disappears, we feel Dot’s solitariness. As the novel progresses, images from the past begin to creep into Dot’s present: “The memories wouldn’t hold, they were unlatched, she felt blurred by some other place and time she couldn’t really see.” Connections begin to fall away as children leave home, parents die, relationships become too burdened by old hurts and neglect. Although the loneliness of aging is not a new story, it is an honest one, and Perkins writes Dot’s later years vividly. While the novel’s structure does a good job of replicating Dot’s sense of time passing quickly, especially as new technology (Facebook, Twitter, tablets) is introduced, by the novel’s end much has been left unspoken and underdeveloped. Fascinating minor characters — such as Name, a young woman living on the commune who has a tattoo of a “love-heart” framing her face — are introduced and then abandoned. While these fleeting encounters may replicate real life associations, in this case they leave the reader wanting more. However, if you allow yourself to enter the world Perkins so painstakingly evokes, you will come away with a heightened sensitivity, perhaps willing to examine your ordinary life and the ordinary lives around you (the harried mother at swim practice, the bumbling old woman in the grocery store, the man walking in the park with his teenage son) in a more tender light.